Simon & Schuster, 9781476729978, 288pp. "A debut collection of unsparing yet warmly empathetic stories...akin to both Anton Chekhov and Raymond Carver in humane spirit and technical mastery" (Kirkus Reviews, starred review). 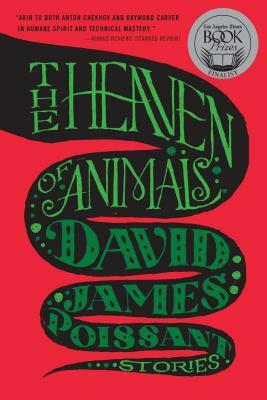 The Heaven of Animals, award-winning young writer David James Poissant's stunning debut, has been one of the most-praised story collections of the year. Named one of Amazon's Best Short Story Collections of 2014, compared to the work of Richard Ford and Amy Hemple in the Los Angeles Review of Books, to Anton Chekhov, Raymond Carver, and George Saunders in the New York Post, and the subject of a full-page rave by Clyde Edgerton in Garden & Gun, this "collection of vicious and heartbreaking vignettes" (The Orlando Sentinel) is a must-read for any fiction lover. In each of the stories in this remarkable debut, Poissant explores the tenuous bonds of family--fathers and sons, husbands and wives--as they are tested by the sometimes brutal power of love. His strikingly true-to-life characters have reached a precipice, chased there by troubles of their own making. Standing at the brink, each must make a choice: Leap, or look away? Pulitzer Prize finalist Lee Martin writes that Poissant forces us "to face the people we are when we're alone in the dark." From two friends racing to save the life an alligator in "Lizard Man" to a girl helping her boyfriend face his greatest fears in "The End of Aaron," from a man who stalks death on an Atlanta street corner to a brother's surprise at the surreal, improbable beauty of a late night encounter with a wolf, Poissant creates worlds that shine with honesty and dark complexity, but also with a profound compassion. These are stories hell-bent on hope. Fresh, smart, lively, and wickedly funny, The Heaven of Animals is startlingly original and compulsively readable. As bestselling author Kevin Wilson puts it, "Poissant is a writer who knows us with such clarity that we wonder how he found his way so easily into our hearts and souls.